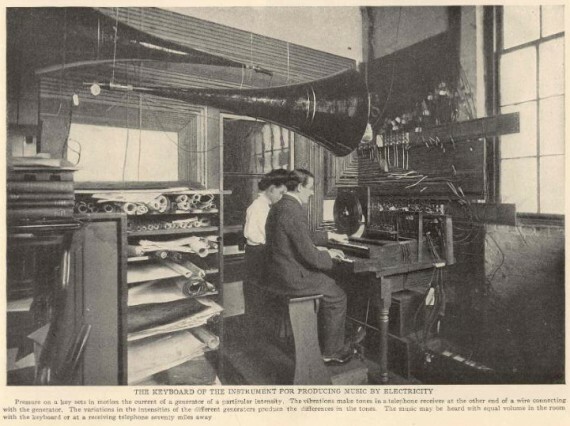 The Telharmonium (also known as the Dynamophone) was an early electronic musical instrument, developed by Thaddeus Cahill in 1897. The electrical signal from the Telharmonium was transmitted over wires; it was heard on the receiving end by means of 'horn' speakers. Like the later Hammond organ, the Telharmonium used tonewheels to generate musical sounds as electrical signals by additive synthesis. It is considered to be the first synthetic instrument due to its ability to generate sounds completely electronically.